Gerald R. Hubbell is currently the Director of Electrical Engineering for Explore Scientific, LLC and an Assistant Coordinator for Topographical Studies, Lunar Section, for the Association of Lunar and Planetary Observers (ALPO), and former president of the Rappahannock Astronomy Club (raclub.org). He is the author of the book Scientific Astrophotography: How Amateurs Can Generate and Use Professional Imaging Data (Springer 2012). He has more than 30 years of experience in the nuclear utility industry as an expert in nuclear instrumentation and nuclear process controls and protection. He has been an amateur astronomer since his teenage years and has been active for more than 5 years in modern astrophotography. Richard J. Williams is the founder and CEO of the Sierra Stars Observatory Network (SSON), a global network of professional remote observatories available to everyone. Starting in the mid-1990s he was a pioneer in the development of robotic telescope hardware and software. He was a co-founder of Torus Technologies (now Optical Mechanics, Inc.), which designs and manufactures robotic telescope systems and custom optical-mechanical devices for government and industry. He owns and operates the 24-inch (0.6-meter) Sierra Stars Observatory telescope located at his ranch in California, which was the first telescope to go online for SSON in 2007. Linda M. Billard is a freelance technical writer/editor with 30 years of experience. Her clients span FORTUNE 500 companies to small businesses. Her focus is developing electronic and hardcopy products sensitive to the technical level of the reader. Products include documentation, marketing collateral, books, and newsletters; proposals; and software requirements analysis and design. Her interest in astronomy ramped up about 6 years ago when she became active in the Rappahannock Astronomy Club (RAClub). 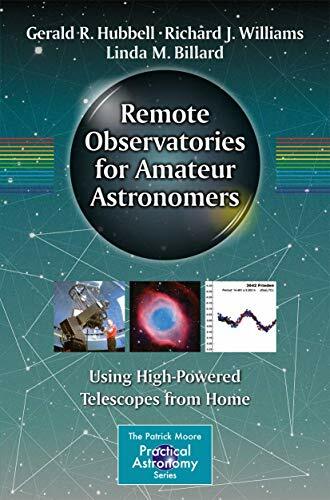 She is the editor/contributor for RAClub's well-regarded online newsletter, StarGazer, and its online presence at www.raclub.org, and the technical editor ofScientific Astrophotography: How Amateurs Can Generate and Use Professional Imaging Data (Springer 2012).